Last few dates of the 2012 tour (Brighton, Coventry, Southampton and Cardiff) now cancelled, Gateshead, Cambridge and London to go-ahead. 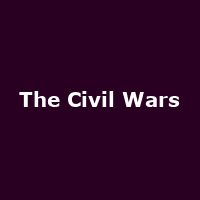 It seems like only last week our Stewart was telling you about this American duo, at a time when actual global civil wars were continuing to be waged in almost every corner of the world, except Scandanavia and the United States. The latter has certainly had its fill and is no doubt a small inspiration for the alt-country and Americana pairing of Joy Williams and John Paul White. The Civil Wars' good fortunes have continued to mushroom since last year - they've been quietly nominated for awards for their debut-album, "Barton Hollow", victorious at the 2012 Grammys, winning both Best Country and Best Folk awards, appeared in countless Best Albums of 2011 lists and all topped off with the announcement of Joy Williams' first child, due in June. Congratulations, Joy. And just to prove that both genres have been courting the duo, Taylor Swift and The Chieftains enlisted their services for recent tracks. As well as all the acclaim, The Civil Wars have justifiably sold out the very tour that our man was telling you about, proof that he knows what he's talking about. The only show still up for grabs during March is Birmingham on 13th - £14 is all it takes to get in, Midlands fans. Later this year, the duo will be back on the road to capitalize on their successes, more of which are surely going to come their way. Their next UK tour will begin on 30th October in Manchester, followed by Liverpool, Glasgow, London (Roundhouse), Coventry, Southampton and finally Cardiff on 11th November. We will have tickets for all shows from Friday morning at 9am, except those last two which will see the light of day tomorrow morning at the same time. Tickets are a little higher this time round at £17 (£19.50 for London), but still worth every penny. There's a reminder of the album's title-track, embedded at the top of this very article. The London Roundhouse show will now finish the tour after the band have cancelled the remainder of the tour (Brighton, Coventry, Southampton and Cardiff) for "personal reasons". Tickets holders for those dates should contact their point of purchase for a refund.